In virtually every recent gun policy debate, anti-gun control groups have made the argument that the USA would be safer, if only people had more guns and were allowed to carry them in more places. These people support the “right” to carry guns in bars, schools, movie theaters, churches, sports stadiums, restaurants, playgrounds and every other conceivable place where a mass-shooting could start—essentially every public gathering place in the USA. This push to arm more Americans is cloaked in the language of self-defense, with the proponents arguing that armed citizens will be able to defend themselves from criminals, just as long as their gun rights are in no way limited. While pushing to promote this increased gun ownership, these gun groups have fought tooth and nail against any new gun regulations and have even sought to repeal the meager regulations which are currently on the books. Unfortunately, this deregulation of guns has made it incredibly easy for criminals to buy guns (ex. 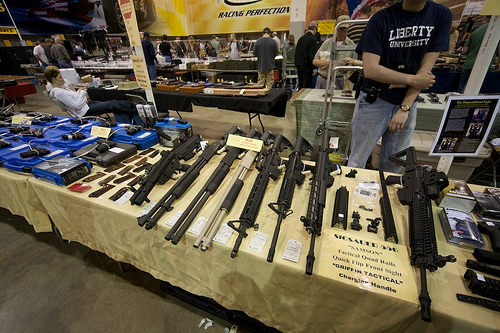 at gun shows or online), and very difficult for authorities to stop the flow of guns to criminals. The NRA and its gun-absolutist cohorts have set up a domestic arms race: They promote laws that make it easy for criminals to get guns and then use the threat of armed criminals to persuade law-abiding citizens into buying guns for self-defense—to complete the cycle, these groups then use law-abiding citizens’ fear of not being able to defend themselves in order to convince them to support the very deregulation which made the problem in the first place. This constantly escalating domestic arms race leads to huge profits for the people who make the guns but results in the USA being flooded with dangerous weapons. The gun manufacturers make money regardless of whether the person buying a gun is an offense-minded criminal or a defense-minded law-abiding citizen. In fact, the economic interests of gun manufacturers lie with both types of people purchasing their product and adding to their profits. By creating increased demand for their goods on both sides of the law and blocking any attempts to prevent criminals from buying weapons—the NRA even fights to let accused terrorists buy guns—the gun industry ensures that there is always somebody looking to buy a gun. If one is to disregard morality and simple human decency in pursuit of profits, this business strategy is extremely effective and well-designed—they have maximized the number of people who are buying guns without having to admit to the fact that they are promoting the problem which people are all afraid of. This situation is analogous to an arms manufacturer selling weapons to both a peaceful democracy and an autocracy with a history of aggression (ex. South and North Korea, respectively). In order to increase their business, this arms manufacturer could sell weapons to the autocracy under the table, then go to the democracy and point out that their violent neighbor is getting enough weapons to be a threat. Because of this threat, the democracy would be compelled to buy weapons in order to balance the threat of their law-less neighbor. If the international community tried to stop this arms race and limit the flow of weapons, the arms manufacturer could scare the democracy into opposing these efforts—after all, the more peaceful country wants weapons to defend itself and is unlikely to trust its lawless neighbor to obey international law (only law-abiding countries obey weapons limits). This fear causes the democracy to unintentionally protect the weapons manufacturers’ ability to keep supplying weapons to the autocracy. 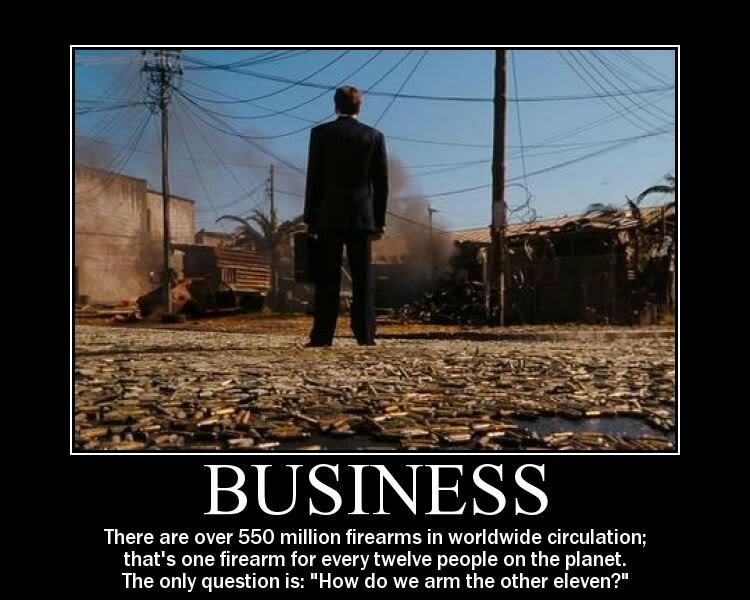 At this point, guns have flooded the USA and there is no easy or quick solution to solve the problems caused by this arms race. Even if no more guns are sold, there are still over 88 guns for every 100 Americans, and these weapons will remain functional for years to come. That said, immediately increasing limitations on who can buy a gun and tracking the guns which are sold would start to choke down on the illegal gun markets in the USA. By imposing background checks, training and mandatory insurance on new gun buyers, it is possible to ensure that fewer criminals are able to buy guns directly. Indirect gun sales (ex. straw buyers) can be slowed by mandating registration of gun serial numbers and firing impressions, so that any gun that is used in a crime can be traced. Once the tide of new guns into the market is slowed, then a gradual process of unregistered firearm attrition must begin. Through buybacks, police confiscations of guns used in crimes, and other gun-collection programs, the numbers of loose guns in the United States will gradually fall (supply is restricted and guns are being removed from the market). There will be intense push-back against this type of program, but it is the only way to end the domestic arms race. Eventually—once the US’s gun murder rate begins to look like the rest of the developed world’s—the fear of armed criminals will fall and the demand for weapons by law-abiding citizens will decrease to sustainable levels. At this point, the domestic arms race will have ended, and Americans will finally stop having to worry about whether they will be the next victim of the next inevitable mass shooting. 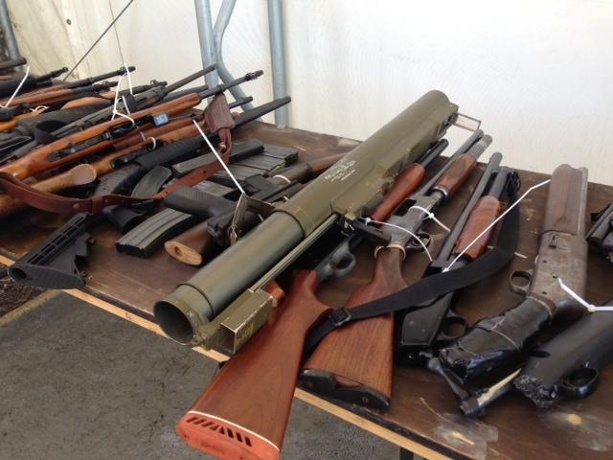 First, I just wanted to let you know that the ominous looking device displayed so prominently among the common firearms in the photo at the end of your article is an inert M72 LAW (Light Anti-tank Weapon) launcher. This weapon is disposable and is capable of only being fired ONCE and is not available to civilians. It is very common to find these empty and useless launchers at military surplus stores. Many people (mostly men of course) buy them to use as props or just hang on their walls as a conversation piece. You can also buy harmless training hand grenades that appear real. I suspect that this launcher was not part of the buyback and was just added later to the collection of weapons for dramatic effect. This photo also displays the flaw of such buybacks. The two shotguns at the far right are damaged and would not be purchased by a pawn shop. These buyback usually have a “no questions asked” policy. Unless the individual attempting to sell the gun is someone who is well known to the police and easily recognized, anyone can sell a gun at these buybacks without fear of arrest in most cases. These buybacks allow individuals to sell guns that have been used in crimes and could have been traced back to a wanted criminal. These programs just provide a way for criminals to make quick money by selling junk. Yes, the guns in this photo are off the streets. However, the criminals likely had many more and will likely use the money to buy better guns or drugs. We already have a law to regulate sales of firearms. All licensed dealers are required to perform a background check for all gun sales. The term “gun show loop hole” was invented by gun control advocates. Even sales at guns shows require back ground checks. Buying guns online requires that the gun be shipped to a licensed dealer who must perform a background check before they can give the gun to the customer. However, private individuals are not required to perform checks if they are selling a gun to another private individual. Unfortunately, this is one way that a gun could end up in the hands of a criminal and of course there is always theft. Gun owners must be responsible when it comes to storage of their guns. My guns are stored in a metal cabinet that is bolted to the wall inside of a locked closet. Tightening laws on law abiding citizens will not prevent crime involving guns or violence as evident by the failures in the UK and Australia. It is a FACT that the ONLY thing that stops a bad guy with a gun is good guy with a gun (unless of course the bad guy shoots himself). However, the bad guy would not have gotten the gun in first place had he been in prison where he belonged and not out on an undeserved parole due to budget cuts. Sorry I posted this comment in the wrong article.